It’s not hard to think of a reason to have a QSO party. SOTA contacts are a lot of fun for all involved. For activators there is the question of whether to reactivate a summit already visited, possibly visited this year, or whether to look for a new personal unique summit, ie. one you have not previously activated. This event was a combination of the postponed VK1 QSO Party and the anniversary of SOTA for VK2/4/6. For this event I wanted to make the best use of the winter bonus and also activate some new uniques. Yankee Ned and Mount Tumorrama seemed to be good options and I looked carefully at maps and planned my trip. 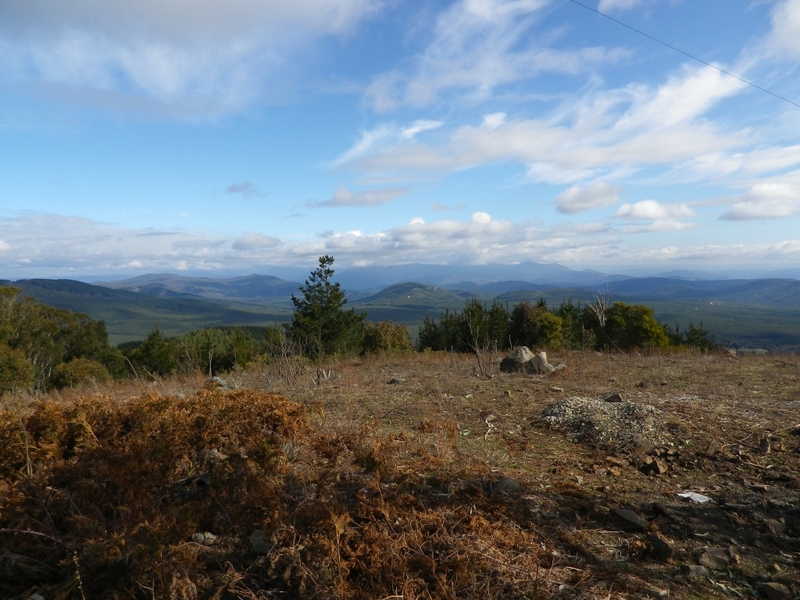 It was a fairly clear day as I drove from Yass to Wee Jasper, then continued towards Tumut on the Wee Jasper Road. There were many roos and wallabies feeding near the road, some creating hazards by reacting unpredictably to the approaching or passing car. I realised when I reached Brindabella Road that I did not have the map prepared at home. I looked up the lat/lon of Yankee Ned using Sotagoat on the phone (which had no coverage there), converted the decimal degrees to degrees, minutes and seconds and input the coordinates into the Garmin GPS. That gave me a direction and distance to reach the foothills of the summit, however on reaching the vicinity of the summit, my location was clearly wrong as there was a much higher summit to the west. I decided to walk up the higher summit and on reaching the top I compared the lat/lon details with SOTA Goat data. It was identical so I knew I was in the right place. I later decided I must have made an error in the conversion of lat/long in decimal degrees to degrees/minutes/seconds, so in future I will use decimal degrees on the GPS unless there is a reason to do otherwise. Getting the radios going I made contacts with Matt 1MA, Andrew 1NAM and Andrew 1MBE, Roald 1MTS. Then on 40m I had some CW contacts with a number of VK3 and VK5 callers. Close-in contacts were difficult, indicating propagation was favouring longer distances than usual. I was hoping for a good number of S2S contacts from this summit. With conditions so unusual, I failed to reach Adan VK1FJAW at Mt Gillamatong. 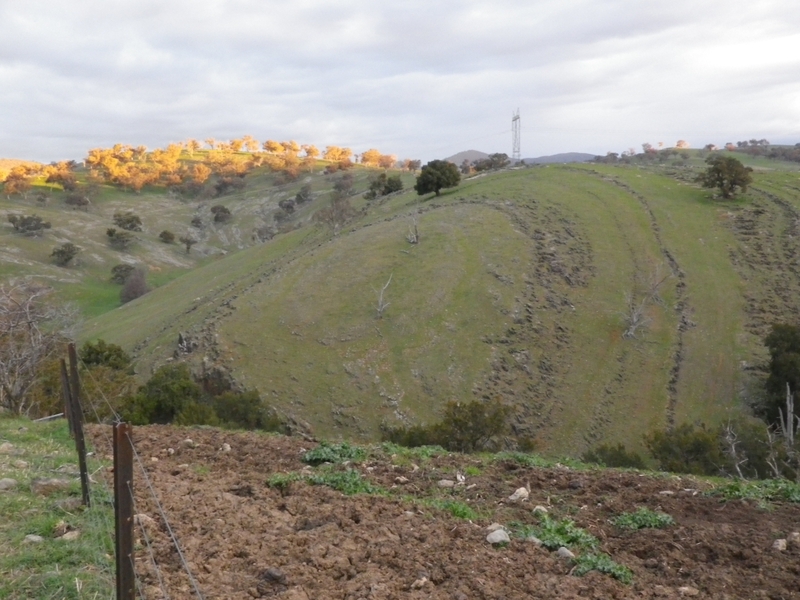 While I was on Yankee Ned, he ended his operation at Mt G and drove over to Mt Palerang, where he had a (self-imposed!) steep climb up the eastern side of the mountain. Conditions were still unfavourable so we missed each other on that occasion. At about 1pm I packed up and walked down the north side of Yankee Ned, reaching the fire trail that encircles the hill, then walking back along the fire trail where my car was parked. I spent 10 minutes making a cup of tea and lunch. Then drove on to Mt Tumorrama, which is easily reached by car all the way to the top. 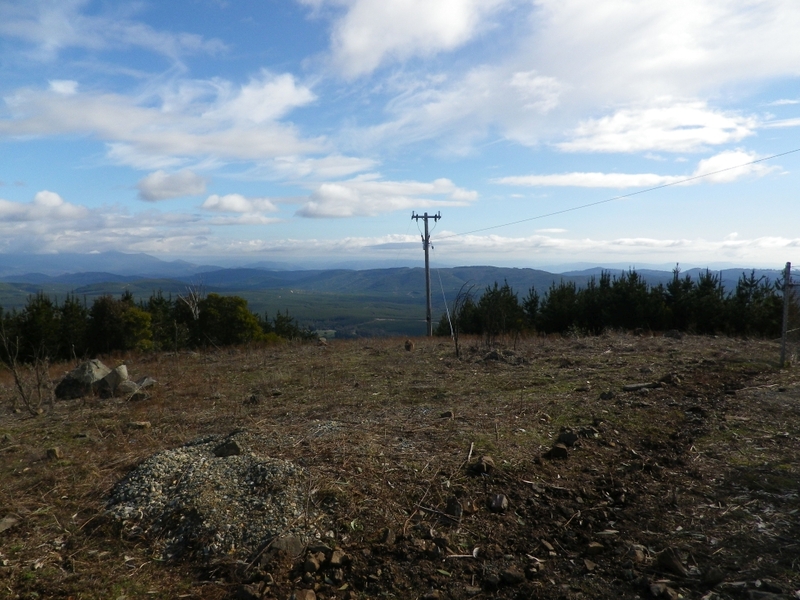 In fact the track I used to access Yankee Ned went back to Wee Jasper Forest Road and the access for Tumorrama was about 10m along the road, almost opposite where the Yankee Ned fire trail emerged from the forest. 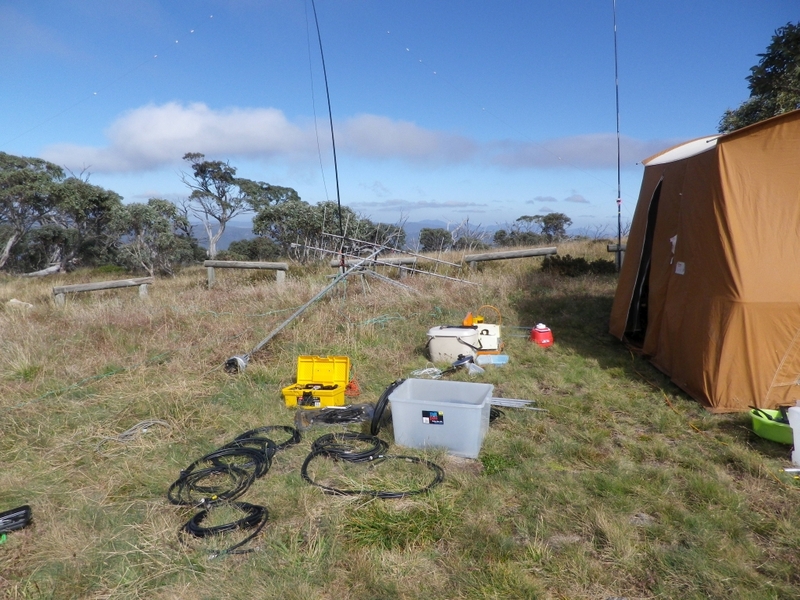 On this summit I spent some time on 2m FM working into the Canberra area, then some time on 40m, both CW and SSB. A text message to Adan discovered he was about to arrive at his third summit, so I asked him to let me know when he would be ready for a contact on 144.150 SSB, as it was clear that HF would not allow any contacts between us. It was about 100km and I felt sure that our little radios would be able to do that distance on 2m ssb. Eventually we did make that contact so that was worth waiting for. The weather on the hill had gradually changed so by 4pm it was quite cool and rain clouds were building up. I packed up soon afterwards and started the 2hr trip back to Yass at about 4:15pm. On the way back I noticed this unusual circular pattern of partly submerged rocks on the hillside opposite the road. Not related to SOTA. Included as a bonus. As in past years I operated in this event at Mt Ginini in two ways. 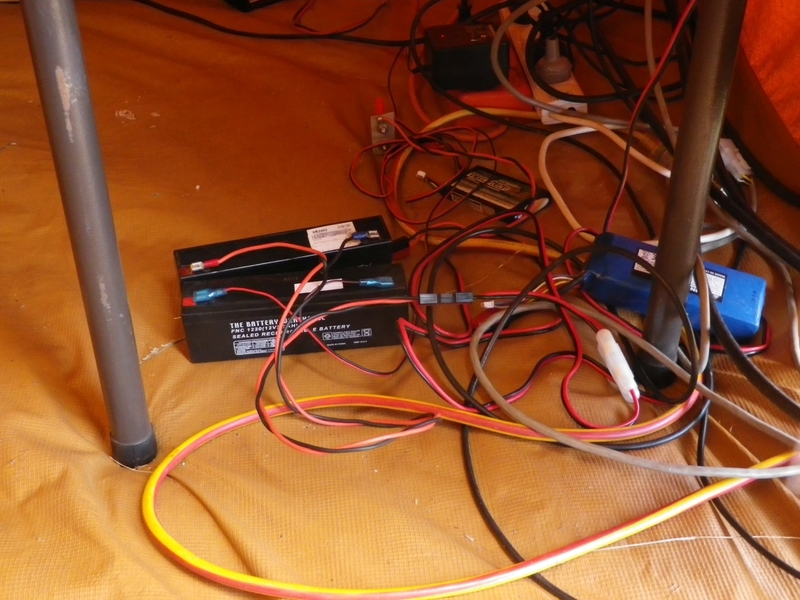 On VHF/UHF bands I used my standard equipment powered by a Honda EU20i generator, with 100w output on 2m/6m, 75w on 70cm and 10w on 23cm. On HF bands I ran 10w from battery power, to be SOTA compliant. I started the site setup at 5pm Friday night, setting up the tent and the HF antennas. Two squid poles supported these antennas. One was a linked dipole for the HF bands from 40 to 10m. 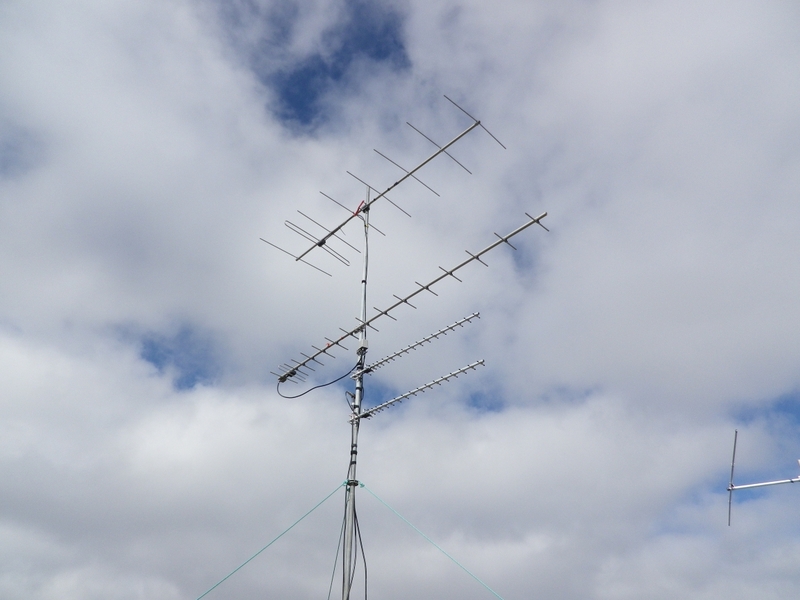 The other antenna was a quarter wave vertical with elevated radials for 20m. The vertical antenna for 20m uses this junction box as the termination of the coaxial feedline, the vertical element above it and three radials each a quarter wave long attached to the binding posts on the sides of the plastic box. This is usually carried up to SOTA summits so needs to be light. 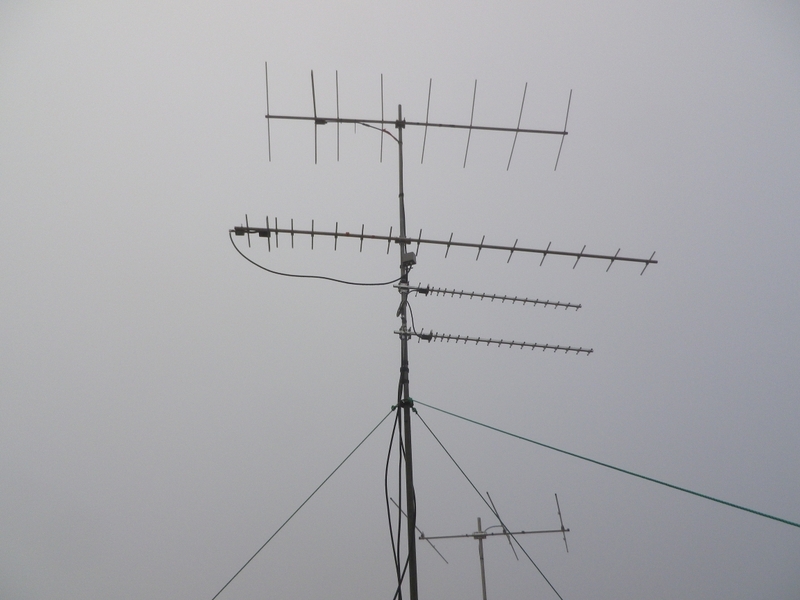 The VHF/UHF antennas were erected on Saturday morning. 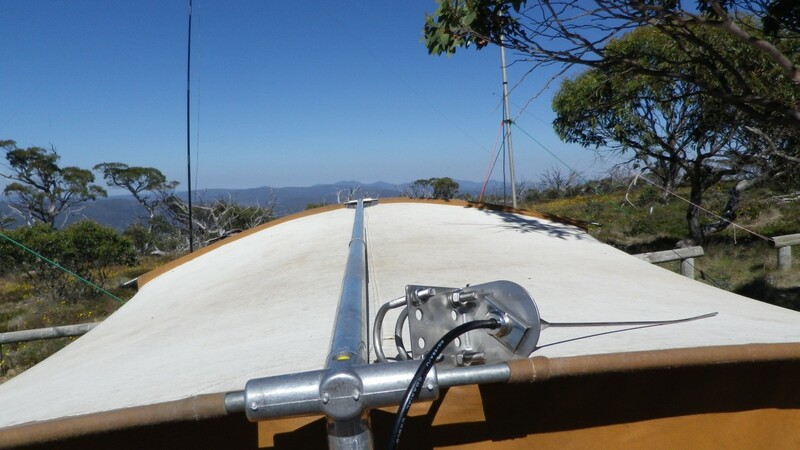 Matt VK1MA and Glen VK1XX arrived to perform some maintenance work on the tower for the repeaters run by the Canberra Region Amateur Radio Club. When I was ready to lift my antennas they were ready to help and fortunately I only needed to adjust the guy ropes. On VHF the band conditions seemed ok, with the VK3RGL beacons on 144.530 and 432.530 were both received with reasonable signals. Towards Sydney the beacons on 144.420 and 432.420 were weak but detectable. Propagation in the north east direction (Sydney and up the NSW coastline roughly) remained ordinary for the weekend. By the late afternoon, I had logged a small number of contacts on 40m and on the VHF/UHF bands. There were a few other field stations, the most prominent on VHF being VK3ER and VK3KQ and I could work both on 6m/2m/70cm without much trouble. The 23cm signals were detectable but only workable on peaks of the fading always present on that band. 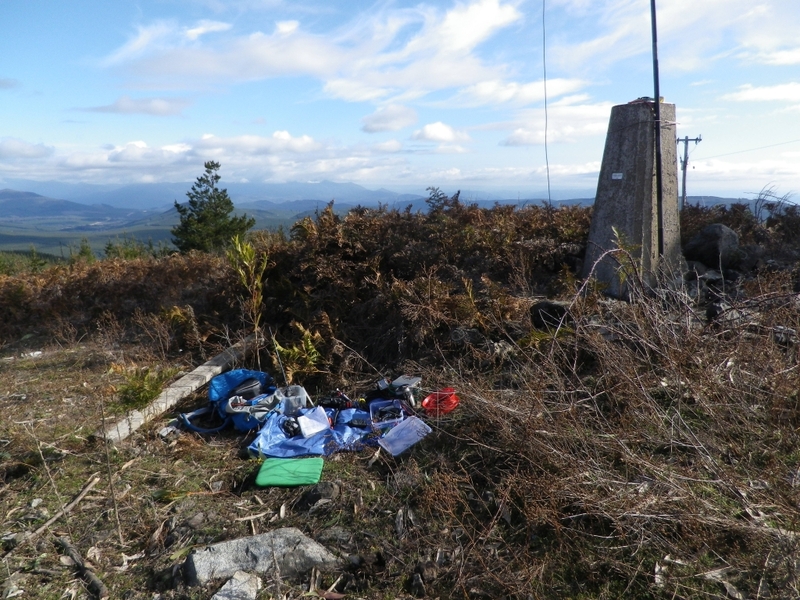 In the hour before sunset I was working some 20m CW contacts as a SOTA portable, conditions did not seem too good on 20m towards Europe but I made a handful of contacts with Europeans and some Australians. The planned ssb activations in Europe were basically inaudible, though with some imagination I could hear faint voices and stations calling them. When you cannot really hear the chasers you know it will be hard to work the activators. Returning to the VHF/UHF bands I had some good contacts into the area west of Melbourne, then heard VK5SR in the Mount Gambier area with a big signal. Contacts with VK5SR were made on 144 and 432, but no signals heard on 1296. Contacts were made at much increased signal levels with VK3KQ and VK3ER on 1296 as well as the three lower bands. VK5RX was worked also on 144, a much more westerly contact in the PF95 grid. I made a recording of an hour of the vhfuhf contacts on Saturday evening and it is published on dropbox. The link is https://www.dropbox.com/sh/nk1raqnjobsi05q/AAC0xA2I82UVYjDQvD_gxpo2a?dl=0 and when listening to the signals from vk5sr on 144 and 432, remember that those signals are from a station 777 km away. VK3KQ was at a distance of about 500 km. During the recording you will hear a contact with vk3er on 1296 where they were so strong with their dish on my direction that I thought they were a local. Then I could hear vk3er at a distance of 460 odd km on 1296 even while they were beaming to Mt Gambier with their their dish 120 degrees off my direction. Conditions were unusually good! Following the contacts with vk3er on 1296 and 50 mhz there was a contact made on 1296 with vk3kq after several tries using 432 for liaison. There was an unsuccessful attempt, another set of dits used as a beacon, then finally a successful contact on ssb. By about 10pm the wind had increased in strength and it seemed unlikely there would be any new contacts made. I didn’t plan to operate after midnight to make contacts in the next 3 hour period so I closed down for the night, lowering both antenna masts so as to protect the antennas from the wind. Having seen stakes almost completely ripped out of the rocky ground by gusty winds in past events, I didn’t want to risk damage to the antennas, the tent or the operator! I woke at about 5am and was very cold, having packed the wrong sleeping bag. It was about 4C that morning which was an improvement over the 2C of Saturday morning, however I warmed up in the car for 20 mins before raising the antennas and getting the station back on the air. A few field stations were ready for contacts prior to 6am but despite trying to work them all before 6 on all bands, a few contacts were missed. Due to the 3 hour time blocks used in this contest it is possible to make contacts in each 3 hour time block, at any time. After the initial flurry of contacts with VK3ER VK3KQ and VK2WG it was time to check the beacons especially looking for VK5 beacons given the good conditions into VK5 the night before. 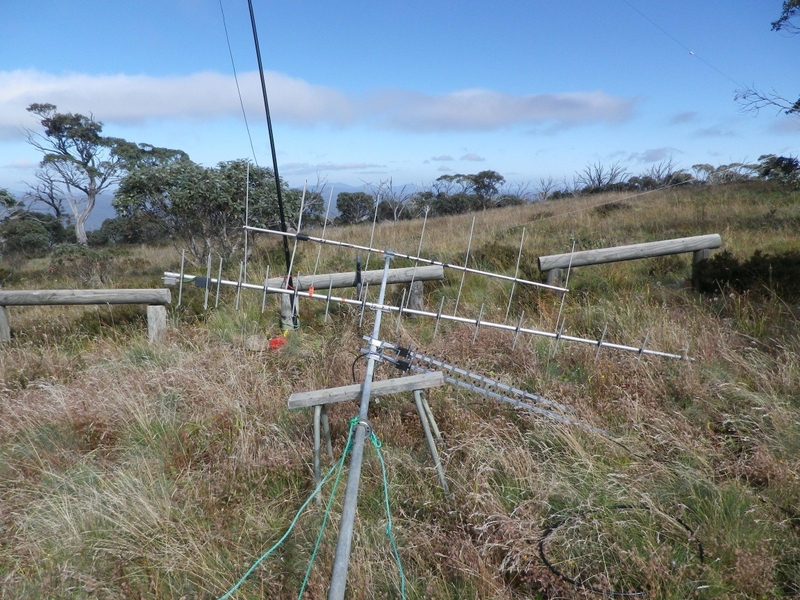 Some of the VK3 beacons were audible, the VK3RGL were good signals on 144 and 432 but the Mt Gambier VK5RSE beacon was not heard. However the VK5VF beacon close to Adelaide was a good signal so I started making CQ calls beaming to Adelaide on 144.150. During the next few hours several VK5 contacts were made on 144 and 432, with a marginal contact made on 1296 with VK5PJ. Jeff VK5GF joined in the fun and his signal remained good for several hours. The VK5 signals were still good after 9AM so we were able to make several contacts for the field day log at these excellent signal levels. 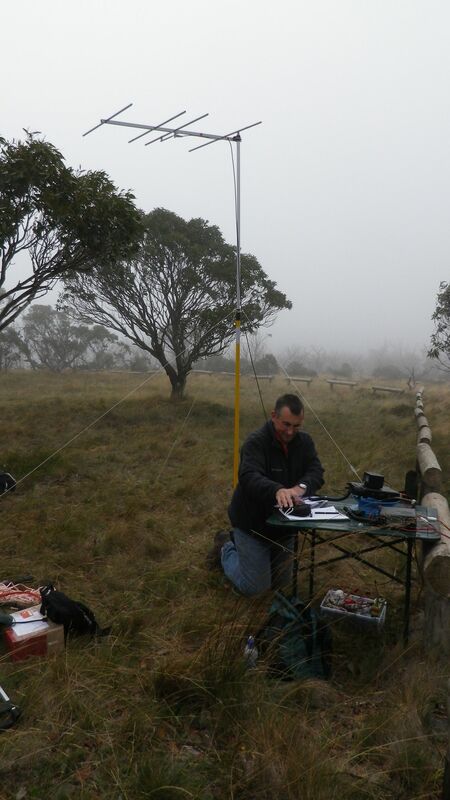 Near Wagga the VK2WG club station was also making contacts into VK5 on 144 and some on 432, though signal levels were markedly lower than those received at Mt Ginini’s altitude of just over 1700m. John VK2YW was operating the VHF station there and he has since commented that he wants to get onto 1296 after hearing of the contacts made there. Operating desk, transceivers, microphones, morse paddles, power supplies and rotator controls. Antennas for 144, 432 and 1296 MHz on the foreground mast, with the 3 element beam for 50 MHz on the mast to the rear. 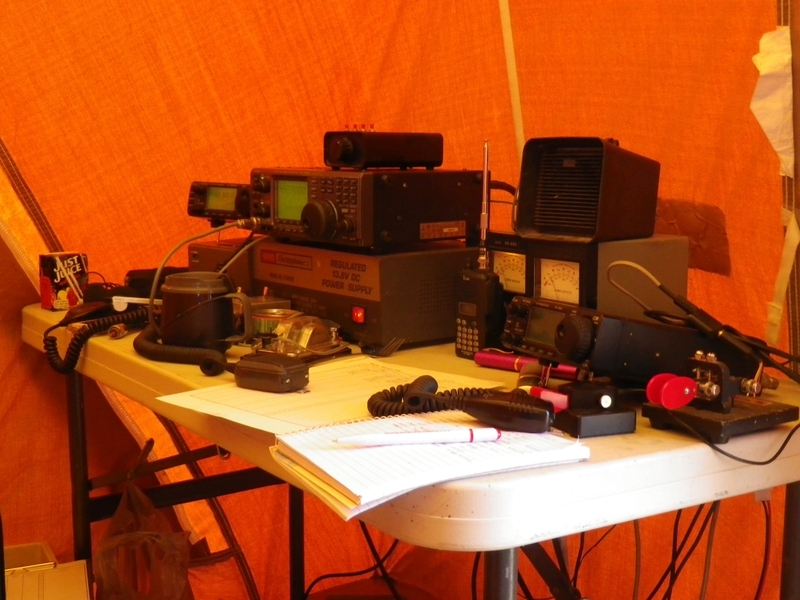 I think this event was my most successful field day from a VHF/UHF perspective. The conditions on 144 and 432 were above their usual level but the results on 1296 were my best ever. 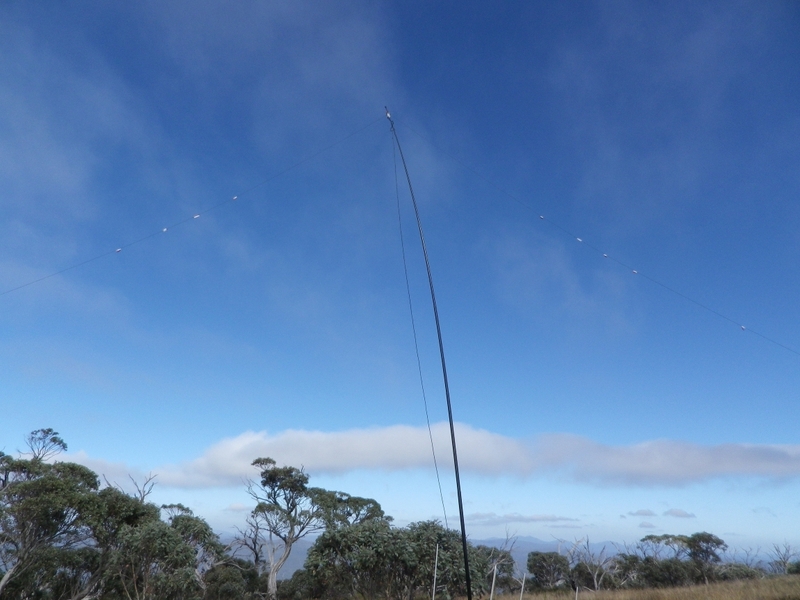 The vhf and uhf bands are a lot of fun in these great conditions. 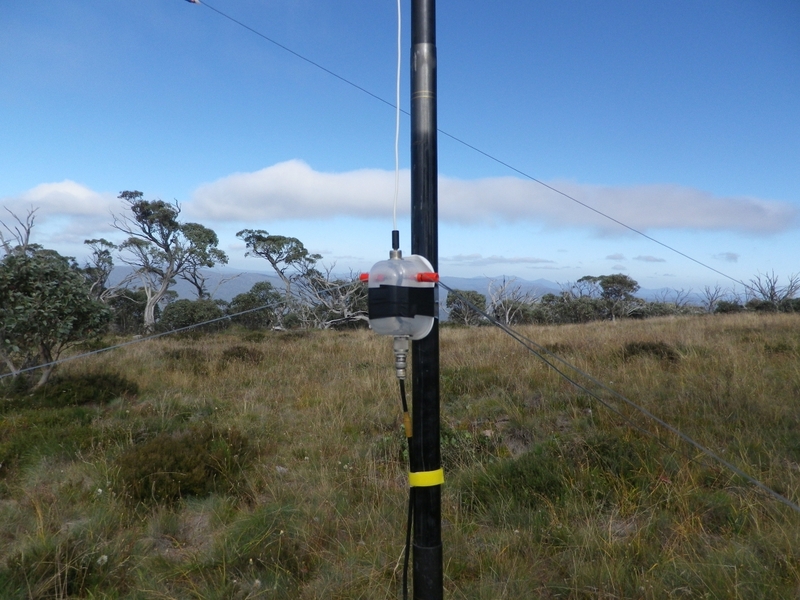 I set up my usual station on Mt Ginini QF44JL for this event. 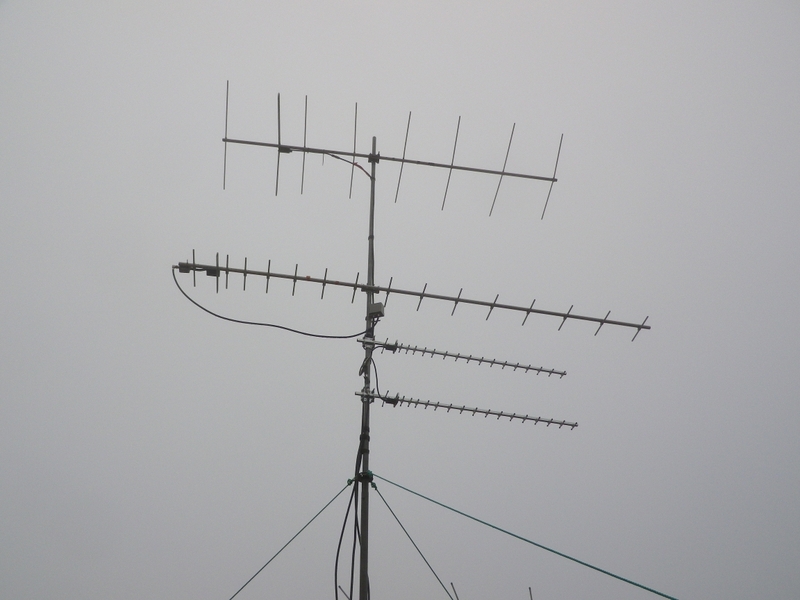 On 50 MHz, a TS670 and a HL66V amplifier producing 60w to a 3 el cushcraft yagi on a 4m mast. On 144 MHz, the IC910H 100w to an 8 el yagi at 6m agl. On 432 MHz the IC910H 75w to a 16 el yagi at 4.5m agl with an icom mast head preamp 1.5m from the feedpoint. On 1296 Mhz I had unfortunately not packed the pair of 18el yagis normally used. As a token antenna to make some local contacts, I connected a 2m quarter wave vertical with about 3m of RG58 coax and laid that horizontally on the roof of the tent, bisecting the side and centre aluminium stressors that are part of the roof structure of my old Coleman tent. This “antenna” gave me some local contacts on 1296 and with effort, a contact with vk2smc near Nimmitabel. On Saturday I found conditions ordinary with no unusual contacts made. 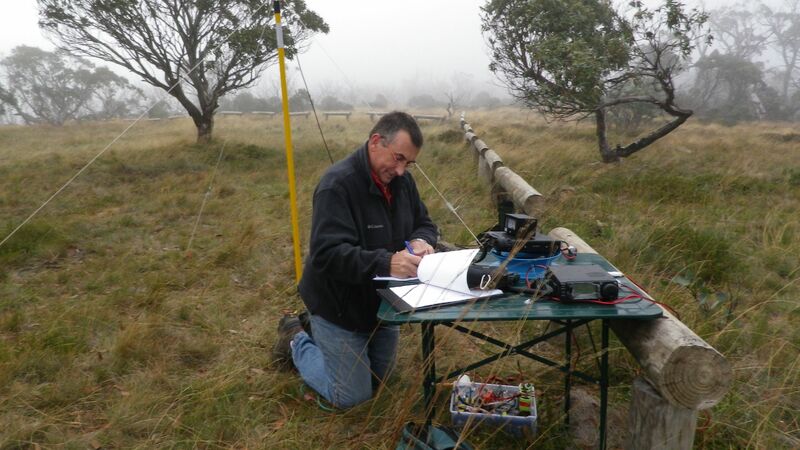 On Sunday morning at 5AM local time I checked the usual beacons from Sydney, Mt Anakie in VK3, Mildura in VK3 and the Gippsland beacon, on both 144 and 432 where possible. 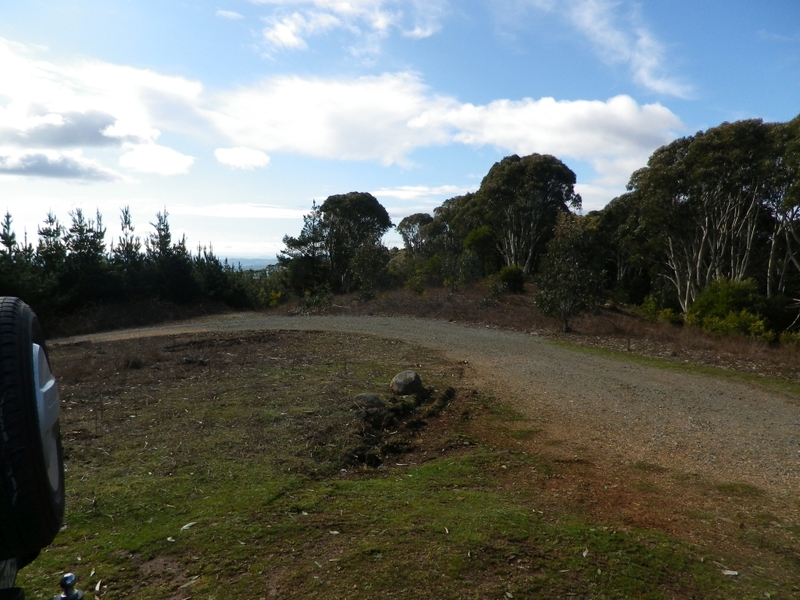 With the very calm conditions overnight I wondered if I would hear any beacons from further afield and checked the Mt Gambier beacon VK5RSE on 144.550 and the Adelaide beacon VK5VF on 144.450. Both beacons were received at good strength, and during the following 5 hours both beacons remained audible, the Adelaide beacon being the strongest signal most of the time until it faded around 9AM, the Mt Gambier signal remaining audible but weak for a little longer. My log notes that VK5RSE was still audible at 2305 UTC, or 10AM local time. At that stage the Adelaide signal had vanished. With these beacon signals received so well, how about making some contacts into those areas? I then worked Bill VK5ACY at 1922 UTC (6:22 local) vk5LA at 1939, vk5AKK at 2006, VK5PO at 2008, VK5DK at 2109, all on 144MHz. I also worked Vk5AKK on 432. 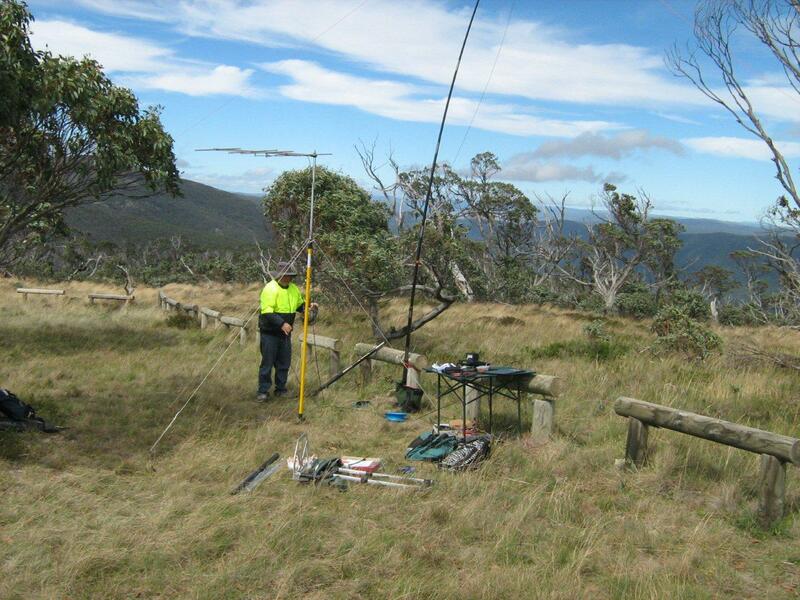 Much later at 2150 I was called by VK5PJ on 2m while beaming to Sydney direction (NE) and made a good contact with Peter on that band, followed by working him again on 432 MHz, still with the beams NE. Turning the beams around to the west produced signal levels of S9+20 (indicated) which is a rare event on 70cm dx. Peter asked whether I had 23cm and I told him that regrettably my real antennas were at home and all I had was a temporary lashup to make local contacts. He was keen to try it given the unusually good propagation we had on 70cm. We tried 23cm first with Peter running a series of dots, so I tuned for that signal on the Sub receiver on the IC910 and could tell him “yes I do hear that, I will send the same to you”… and the outcome was a good 5 x 1 contact on SSB. Back on our “liaison frequency” 432.160 where signals were still s9+ I told Peter what the antenna was. “It’s a 2m quarter wave lying on the roof of my tent”. He asked for a photo…I took the following photo immediately while still sitting at the desk talking with him. Note the precise calibration of the angles. Here is what it looked like from the outside. 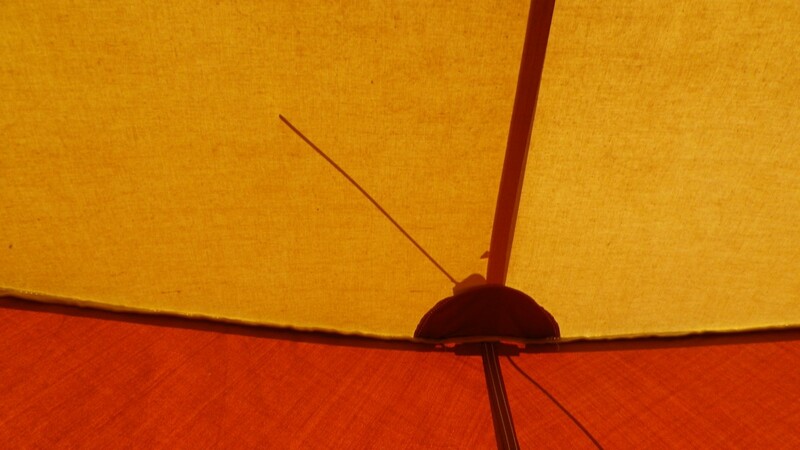 Tent roof antenna. Note the centre boom and the supporting spines all aluminium. 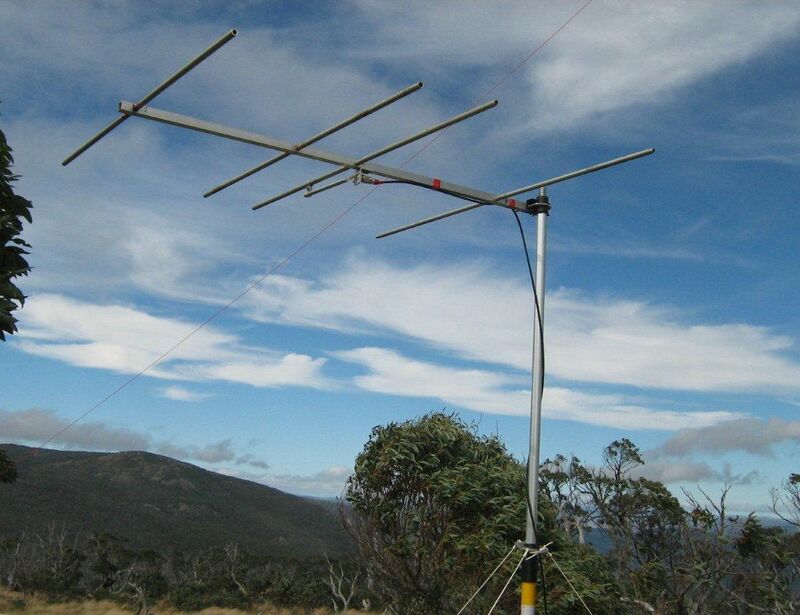 the antenna received best signal on 1296 when at 45 degrees to those tent supports. Adelaide is close to the direction of the centre boom. I then asked him to run the beeper again so I could try to optimise the orientation or location of the antenna. I tried vertical and horizontal polarisation in various orientations. Eventually I returned the antenna to its original position where by good luck, the signal was best. You would not read about it. Later at 2223 I was encouraged to give this antenna a try working VK3ER where Peter VK3QI was keen to make the contact. And yes it did work, even on ssb. 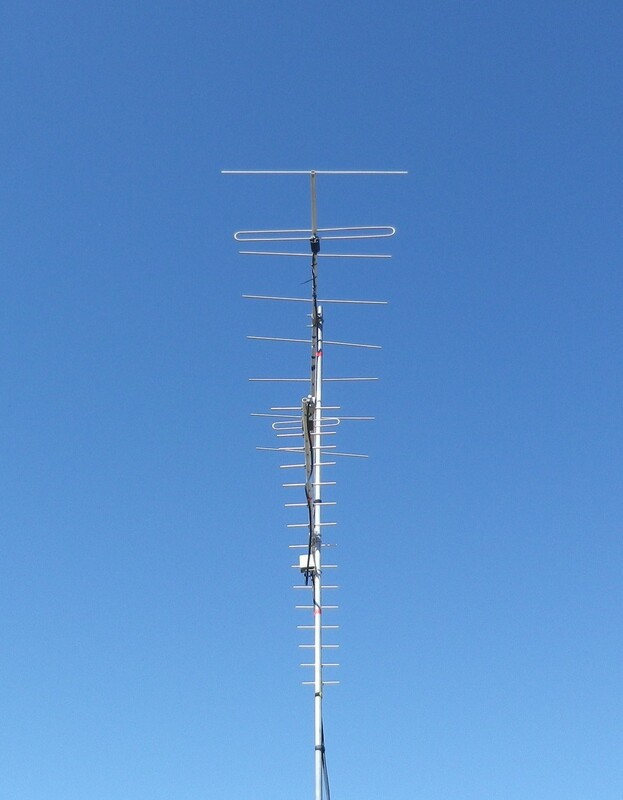 In the past we have made contacts with my real antennas but sometimes it has been quite difficult, cw-only. Clearly propagation was unusually good between us. A later attempt to hear or work Gordon VK3EJ at Cobram was unsuccessful. Whatever atmospheric effect was allowing these longer distant signals to reach Mt Ginini was not active for the shorter distance to Cobram. 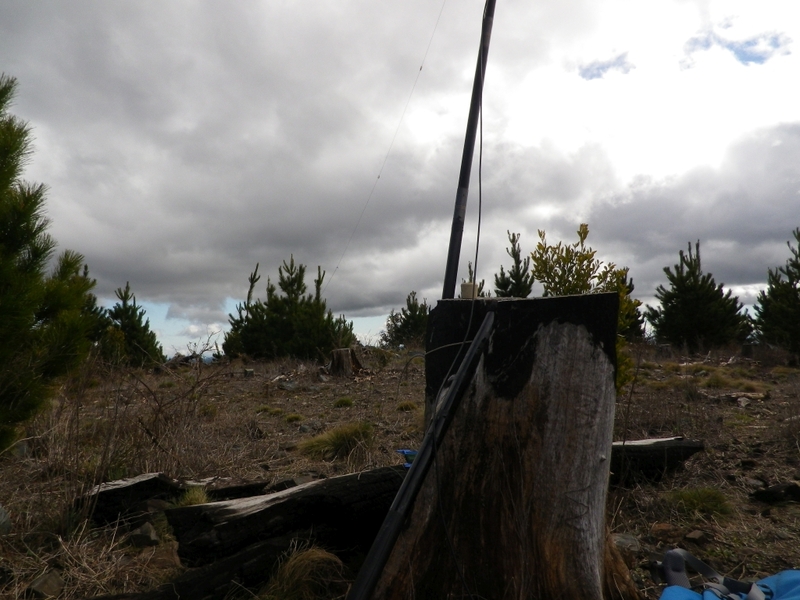 This is where the 1296 yagis would normally go… just below the 70cm yagi on the mast. Summary: 145 or so contacts, some ordinary and a small number of extraordinary contacts, coinciding with very hot daytime weather and a calm morning. Once again the beacons were a great indicator of the possibilities ahead. As my brother Chris VK2DO pointed out, it looks like the many tickets purchased in the “field day lottery” over the past 20 years have finally paid off and I have certainly been rewarded with some great fortune this time. If only I had my real antennas for 1296, and how about the higher bands? Will never know, can only continue to take tickets in the lottery and hope it doesn’t take another 20 years to produce results. This was a joint activation with Andrew Moseley VK1NAM. 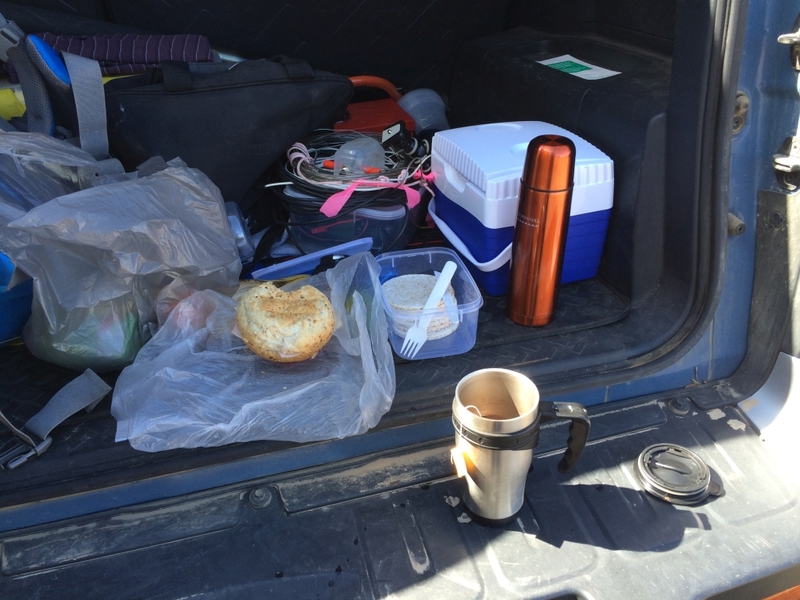 We met at 6:30am at Weston, ACT, and arrived at Mt Ginini around 8am. Ensuring we complied with the SOTA rule of entering the activation zone on foot, we parked about 40m below the summit and walked up with the equipment, with some attached to a luggage trolley. This reduced the number of trips up from the car, but the trolley was still lumpy with Andrew’s massive collection of SLA batteries on board. 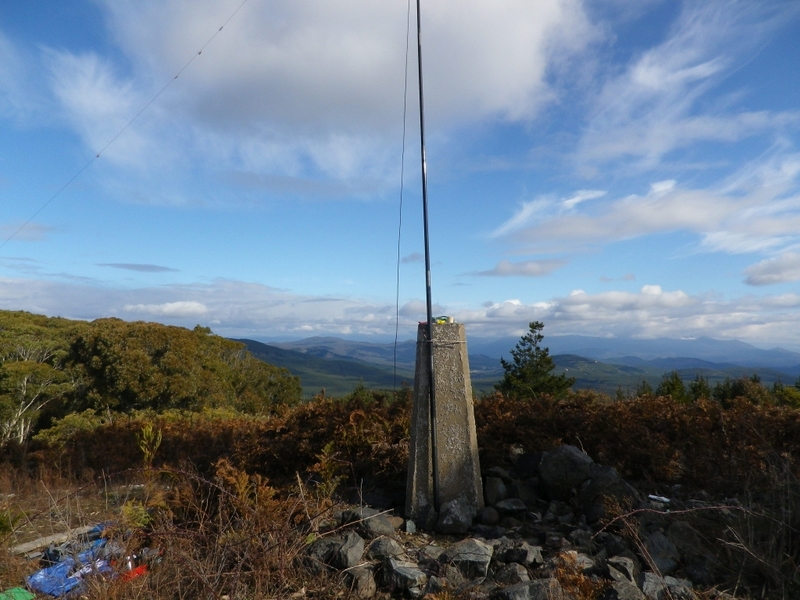 We got onto 2m SSB and made a number of contacts with VK3BJM, VK1KW, VK3VL, VK2BXT VK2KOL, VK3II, VK3EJ, VK3ES, VK3AJN and were called by VK3KH on a peak that did not last long enough to make a contact. To make the most of the aircraft enhancement peaks we tried to work each station using both our callsigns. These contacts were made using a FT857 running 40w output, to a 4 element yagi. The mast was a 4m painter’s extension pole with a guying plate attached mid height. At about 9am we got 40m going with the IC703 and continued on 2m with local contacts on FM. 40m seemed to have very selective propagation at that time of day, with contacts possible from some vk3 portables into the Canberra area but not available to us, presumably due to being just inside the skip (exclusion) zone for that frequency. That situation gradually changed and by 11AM we were able to work any stations others were working. Ionospheric propagation always has its interesting behaviour. 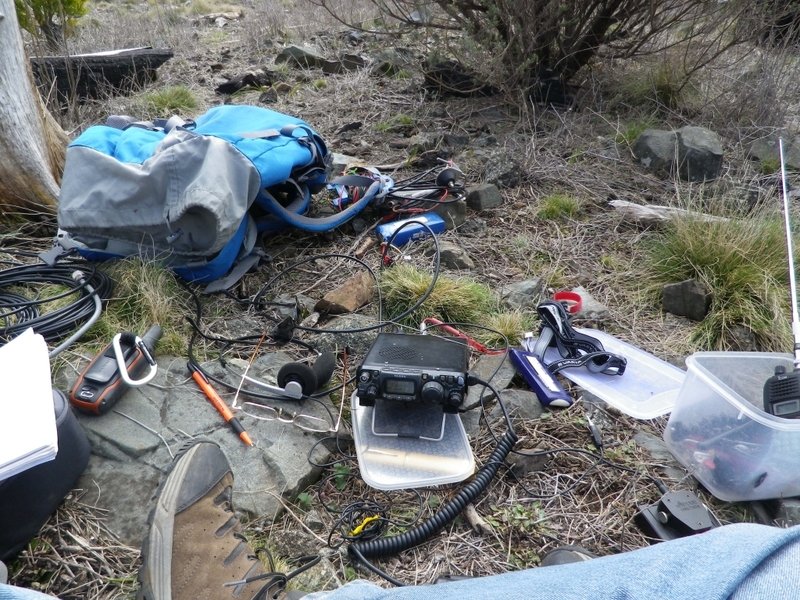 While we had qualified for our SOTA activator points for the summit, we tried to stay on air long enough to give chasers and other activators the contacts they needed. Finally around 11:30 we thought we had exhausted the possible contacts. Other bands were checked but available contacts were nil. There was quite a bit of interaction between the IC703 and the FT857 when using two HF bands, not surprising given the close proximity of the antennas. Separating the antennas by at least their own length to reduce that problem would be a good plan for future joint activations. Calls worked on 40m were VK3KAN, 3DET, 3MRG/p, 1RX, 3ZPF, 3PF, 3YY/p, 3HRA/p, and VK1RX and 1XYZ were also worked on 2m FM. Weather conditions: very windy, quite cold. I wore a few extra layers and was not warm at any stage. The mountain area was in low cloud for an hour or so after we arrived but gradually cleared up giving us the typical Ginini views.